Just a minor site announcement about a new section we are adding. Campfire recipes that are easy to make, tasty, and well just plain fun.Like the title says “When you camp, you gotta eat.” and with that in mind we are adding a Recipes section to share camp cooking ideas, tips, and tricks. 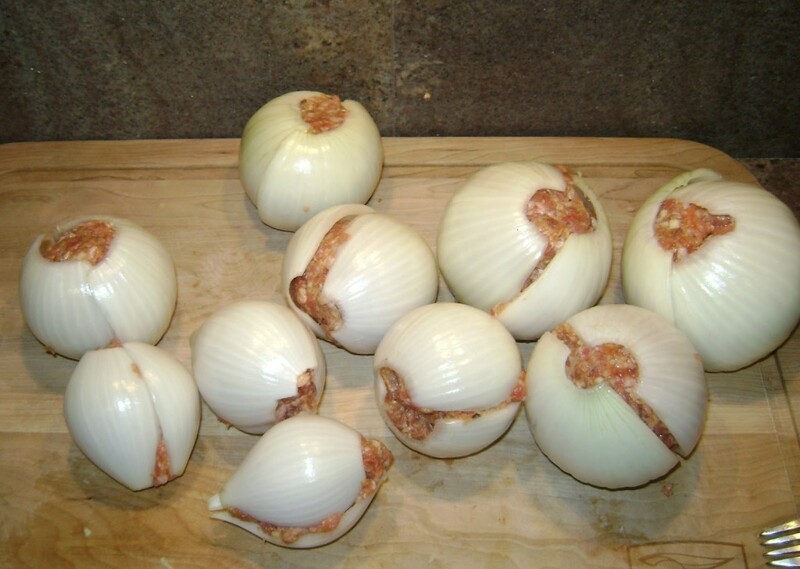 Our very first recipe Onion Bombs. There are a ton of variations on this. The filling is far less important then the concept on this recipe. Make your own version of a meatball, use more sausage, no sausage, make them hot whatever you desire. Do not mix, this is for a topping after the rest is cooked. Cut the both end off the onions, set them on one cut end, then cut in half. Peel the onion and separate into matching pieces. In a bowl, mix together all the remaining ingredients. It is easiest to use your hands and only mix it just enough to blend everything. Fill both matching sides of the onion then press them together, wrap them twice in foil and set aside. To cook, place them in a large amount of very hot coals for 15-20 minutes, flip over and cook for another 15-20 minutes. Total cooking time will depend on the size of your bombs and the hotness of your coals so check on them to be sure they are cooked all the way through. To serve, remove the foil and top with whatever makes your taste buds happy! I like hot sauce and even cheese. For an extra bonus wrap them in bacon!